We recognise that the single-minded pursuit of economic growth is not a sustainable approach to business. We believe that long-term profitability should go hand in hand with upholding and promoting the rights and welfare of our people and communities, as well as safeguarding our natural resources. Organisational health refers to the general well-being of an organisation, that is, its ability to function efficiently and effectively – adapting to change as the need arises while nurturing growth throughout its ranks. From the outset of the Business Transformation (BT) process, Gem Diamonds has recognised that the organisational health of the Group is a critical enabler of the success and sustainability of the process. To ensure we took a data-based approach to nurturing the Group’s organisational health throughout the BT process and beyond, in October 2017, we ran an organisational health index survey across the Group to determine the business’s well-being and the areas in which we could improve. This survey helped us to identify specific initiatives to be implemented as part of our organisational health campaign, with the aim of improving our survey score over the twelve-month period. To ensure the process was inclusive and achieved maximum impact, the campaign included both employees and contractors. Through engagement with our workforce, the campaign – which was aimed at transforming the way we do business – was named Tsoelopele, a Sesotho word meaning "progress". Thirteen priority practices were identified and grouped under the title CARE, an acronym that stands for Clarity, Achievement, Respect and Engagement. Amongst the 48 organisational health initiatives implemented during the twelve-month period were various workshops, anonymous suggestion boxes, and recognition for good ideas from those who were happy to identify themselves. The Tsoelopele organisational health campaign ran successfully during 2018, building on the momentum achieved during 2017. A follow-up survey was conducted towards the end of 2018. The results revealed that the Group had successfully reached its overall improvement target. Given the additional pressure employees were facing as part of the Group’s transformation journey, and when benchmarked against industry peers, the survey’s results truly highlight the significant success of the initiatives implemented. We believe that this progress did not happen in isolation. It demonstrates the deep level of commitment of our leadership and senior management towards the health and well-being of our people. The 2018 results will inform our processes going forward, enabling us to refine the way the Group engages with employees. In the year ahead, we will focus our efforts on deepening engagement with our contractors through workshops and other platforms to better inform our approach to this important stakeholder group. We will also focus our efforts on developing an employee value proposition that is able to effectively communicate the holistic benefits of working for Gem Diamonds and, in this way, improve employee engagement and retention as we bolster organisational health. Making sure our business is operating effectively is a critical management priority. In October 2017, we ran an organisational health index survey across the group to determine the business’s well-being and the areas in which we could improve our organisational health. The process of naming the campaign, aimed at transforming the way we do business, was made open to employees, and the result – Tsoelopele, a Sesotho word meaning "progress" – has caught on as a connotation for the recognition and reward within the Group. Stickers with the campaign name and logo have been developed and are awarded to those who show leadership in their roles. The campaign was driven by representatives at each site, rather than out of the corporate office. The surveys were translated into languages spoken at each of our sites, and mobile stations were set up to guide those who weren't confident in their ability to complete the survey on their own. Anonymous suggestion boxes were set up, and recognition provided for good ideas from those who were happy to identify themselves. Our contractors were also included in the survey and campaign. We are confident, therefore, that the results reflect the true feelings of our employees. From the survey results, twelve priority practices were identified and grouped under the title CARE, an acronym that stands for Clarity, Achievement, Respect and Engagement. To address the findings of the survey, we rolled out several initiatives to engage with our people, including evening events to share and internalise our company values and a Group-wide newsletter designed to ensure that communication occurs throughout the Group. Leaders have become more engaged as a result of the campaign, and our toolbox talks and other communications are more constructive and directed as a result of the two-way communication that the campaign has instituted. Overall the programme has been met with approval across the Group. The initiatives addressing priority practices are ongoing, and their rollout is envisaged as taking place over the next 18 months, at which time another survey will be conducted to measure whether the intended outcomes have been achieved. At Gem, we believe that the anticipation and prevention of risks is critical to keep our employees safe. This approach has proven to be successful in our pursuit of zero harm. In 2017, we applied that same ethos to a wider context by including our natural environment in our Group-wide analysis of health and safety risks. Thus, we began to flag threats to the environment in much the same way as threats to the health and safety of our employees and visitors have been proactively identified in the past. Initially this shift took the form of an awareness programme, to educate employees about the activities of the HSE Department and the types of environmental threats that they should be cognisant of. The response to the programme has been overwhelmingly positive, and has taken an unexpected form: as well as flagging possible risks, employees have been acknowledging positive proactive behaviour where they see it, for example in water-conservation practices. What has been particularly heartening has been the way in which this acknowledgment of positive behaviours has spread to our approach to health and safety. Positive behaviours have been increasingly rewarded instead of negative behaviours being admonished. The number of proactive HSE reports saw a significant increase over the year, from a monthly average of 60 in the first quarter to a monthly average of 120 in the last quarter. Another indicator which has increased recently has been our near-miss and nonconformity reporting. This indicates a clear commitment to the proactive approach, and a concern amongst employees for the safety of their peers. Typhoid fever is a serious disease spread by contaminated food and water. Symptoms of typhoid include lasting high fevers, weakness, stomach pains, headache, and loss of appetite. Management of the disease remains an ongoing challenge at our Letsêng operations. In 2017, we amended our approach to typhoid management to take into account the fact that the disease can be carried asymptomatically. To address this, we changed our screening procedure to include regular screening and testing of all staff engaged in high-risk areas such as catering. Staff who are identified as carrying the disease are then reassigned to lower-risk areas. While this new approach resulted in an increase in the number of occupational health cases reported in 2017, predominantly due to an increase in the number of typhoid cases reported, we believe it is the right approach to prevent the spread of the disease. It should be noted that none of the cases of typhoid reported in 2017 reflected cases of symptoms presented on site, and rather this highlights the effectiveness of the preventative screening process. Diamonds represent more than simply a financial investment; they are gifts, tokens and heirlooms exchanged and purchased because of the special place they hold in people’s hearts and minds. Guarding this intangible value is essential to the long-term financial viability of our business. To support the diamond industry and enhance the premium brand of diamonds, Gem Diamonds was one of the founding members of the Diamond Producers Association (DPA), established during 2015. The objective of the DPA is to promote the interests of diamond producers and support the development of the sector. This includes maintaining and enhancing consumer demand for and confidence in diamonds, as well as sharing best practices in health and safety and environmental management with our diamond peers. During 2016, from market research conducted, the DPA realised that younger consumers are looking for a deeper connection – something real and rare in an increasingly disconnected and digitised world. The research further highlighted how these consumers had shown less interest than previous generations due to the negative publicity diamonds have received over the years. In response, the DPA launched the ‘real is rare’ campaign. (For more information, or to view the campaign online, go to http://www.diamondproducers.com/real-is-rare/real-is-rarecampaign.) As part of the campaign, the association called on diamond producers to display how they are upholding the rare beauty of diamonds in their value chain. This is a matter that sits close to our hearts at Gem Diamonds as we believe that it is our duty to respect human rights, directly and indirectly, throughout our supply chain. Our consumers can be assured that our diamonds are not associated with any human rights abuses, and the greatest care has been taken in mining in a way that is environmentally responsible. We believe that this report showcases the value we create, not only for those within our organisation, or the consumers who purchase our diamonds, but for the societies, communities and individuals who reside in the areas in which we operate. Rough diamond characterisation at Letšeng. Our people are the heart of our organisation, and as such, their safety is our top priority. We work tirelessly towards our vision of an injury and illness-free workplace where every employee goes home safe and healthy. The starting point for achieving this vision has been our BBC programme, which began in 2010 at our Letšeng mine. The name reflects the heart of the programme, which is a desire to care for one another in a manner that reflects a family model, taking responsibility for your brother or sister’s safety as well as your own. The programme commenced at the operation’s executive management level and was gradually implemented throughout our operations to the operator level. Over the years, this programme has taken root in the hearts and lives of all those on the mine, and we have seen the fruits extend well beyond the mine. Wherever possible, the mine seeks to provide medical care to the communities surrounding the mine. Being a brother’s keeper means taking responsibility for all team members and ensuring that they work safely. This care has become a part of the very essence of the people who work at Letšeng and will continue to bear fruit in the future both in safety performance on the mine and in the care extended beyond the mine. In late July 2016, extreme weather conditions were experienced across the Maluti Mountains in Lesotho where the Letšeng mine is located, with excessive snowfall and severe winds limiting access to the mine. Letšeng provided accommodation and food to approximately 250 community members impacted by these life-threatening conditions. The assistance provided to these community members was given without hesitation despite the fact that it placed massive pressure on resources allocated for those working at the operation. It is a true testament to the pervasive culture of care that is such an inherent part of the Letšeng team that no inconvenience or sacrifice was too great to make this happen. The mine assists, when necessary, those travelling along the A1 road that forms part of the journey to the mine. In fact, during 2016, Letšeng responded to 14 motor vehicle accidents between Oxbow and Mapholaneng. One of these accidents involved a two-year-old boy, Lefa Molupe and his grandmother, Maboithatelo Tšita, both from Ntlholohetsane in the Mokhotlong area, who were rushed to the Letšeng clinic. Maboithatelo had sustained minor injuries, but Lefa was in a critical condition upon arrival at the clinic. While working to stabilise Lefa, the clinic radioed the Lesotho Defence Force to arrange an air evacuation to the Mamohato Memorial Hospital for further treatment. However, the helicopter could not land due to inclement weather. The boy was then transported by the Letšeng ambulance to Botha-Bothe (75km) where the helicopter had landed. Having received the correct treatment, Lefa made a swift recovery and was out of ICU in two days and was released from the hospital four days later. Lefa and his grandmother later visited the mine to thank the clinic staff personally. “I want to thank the Letšeng mine from the bottom of my heart. The doctor, the nurses and everybody at Letšeng showed us unimaginable compassion at the moment when I had given up hope. I don’t have words to describe my gratitude because I don’t know what I would have done without their assistance,” said Maboithatelo. Article in the Sunday Express newspaper. Ntsopha Mosili has been part of our environmental team at our Letšeng mine for many years now. Having studied a BSc in chemical technology, Ntsopha has always known that he would study science but was not quite sure in which direction it would lead him. In 2011, having completed his BSc, Ntsopha was offered a bursary by Gem Diamonds to study process engineering. He joined the mine as an intern in 2012, having signed on for a two-year internship. His enthusiasm and commitment, however, was something we recognised early on and he was absorbed into the Company as an environmental officer long before his internship was completed. He worked as an environmental officer for four years during which time he engaged in several projects, including leach testing, our wetland project and, more recently, our pilot bioremediation plant project, enabling him to pursue his passion for learning and applying knowledge gained in the field. Q: What has working for Gem Diamonds meant to you? A: It has meant a great deal. I have been allowed to follow my interests and have been given opportunities to apply what I have learnt in a unique setting. A: I am excited about the projects we are doing. The water projects have been an area of excitement and provided me with an opportunity to do what I love – learn. Our aim is to prevent and mitigate environmental harm to make what we do more sustainable. An example of this is the work we are doing with nitrates. Our findings took us to the source of the nitrates where we worked to find more efficient ways of blasting that would result in fewer nitrates being released into the water system in the first place. We are still exploring ways of improving our blasting processes even further. We have also focused on remediating the historical damage. All the projects we have pursued in this regard have had sustainability in mind. We have wanted to find solutions that work for the business and nature. We have not at the end of this journey but our drive to do the right thing, the best way, has made us leaders in this field and that is exciting – knowing we can make a difference not only here but beyond this mine. Q: What has made this success possible? A: The success we have had with our projects to date has not been without failures and bumps along the way. What we have achieved would not have been possible without the commitment and effort of my colleagues and the support and encouragement of management. Everyone here wants to see the best outcome achieved and is willing to do what it takes, and that makes all the difference. Q: What has kept you working for Gem Diamonds? A: I have been encouraged to pursue my passion. Having expressed an interest in further refining my focus to water management issues, I was given the opportunity to become a line manager in the engineering department where I will be focusing more on water issues. The opportunity for growth has not only encouraged my growth but kept my passion alive. Ntsopha Mosili describing the bioremediation process. We work tirelessly towards our vision of an injury and illness-free workplace where every employee goes home safe and healthy. The nature of the work we do, as well as the remote and extreme conditions associated with our mining operations, means that we operate against many obstacles in the achievement of this goal. This year, we are pleased that these efforts have borne the fruit we desire, with Gem Diamonds reporting an LTI-free 2015. Keeping our employees sensitised to the dangers in their environments remains an ongoing challenge. We realise that good health and safety management is not only about the systems and policies that are put in place, but also about how our people feel about safety and health. The goal, therefore, was to bring about a cultural transformation that required new ways of thinking throughout all levels of the organisation. The first step in this cultural transformation was the implementation of the behaviour-based safety programme, which began in 2010 at our Letšeng mine. The programme commenced at the operation’s Executive Committee level and was gradually implemented throughout our operations to the operator level. During 2015, the name of the programme was changed to behaviour-based care (BBC) as this better reflected the heart of the programme – a desire to care for and protect oneself and other workers on site. The programme encourages employees to participate in the mine’s health, safety and environmental management programme and seeks to cultivate a culture of prevention. The BBC system assists employees to internalise good safety behaviour, identify risks in the workplace, and make appropriate safety-conscious decisions. The programme has also enhanced a culture of collaboration across the Group. We have seen an increased sense of accountability and involvement. This collaboration has also led to increased dialogue around health and safety issues, bringing new perspectives that allow us to stay abreast of the changing conditions in each employee’s work sphere. Teamwork has also been a focus in the programme. Employees operate in BBC teams to share responsibility for one another. The BBC teams reinforce team pacts, a continuous commitment to working safely, on a daily basis. As part of the pact formation process, each department identifies and prioritises risk exposure areas. The principle of being our brother’s keeper’ forms an important part of the BBC programme and is reinforced daily as part of the BBC team’s pact. Being a brother’s keeper means taking responsibility for all team members and ensuring that they work safely. Another essential component of the cultural transformation that we have seen across the Group is the influence of our visible felt leadership initiative at both Letšeng and Ghaghoo. This initiative aims to involve management in hands-on, on-site safety matters. Line managers carry out weekly visits to various sites. During these visits, management engages with employees at their place of work to discuss the importance of working safely and taking care of one another. These visits also provide an opportunity for workers to express their safety concerns to the management team, helping the Group identify, monitor and manage risks proactively. At Letšeng, in an effort to keep the message of safety and care fresh in our employees’ minds, the reminders of what we are striving for are embroidered on their jackets. While our Letšeng mine has been working tirelessly since 2010 to create this culture of safety, our Ghaghoo operation has had to face the challenge of bringing the mine into an operational state and thus is in the initial stages of the full implementation of the above programmes. The achievements with regards to health and safety at both of our operations, however, speak for themselves.While our Letšeng mine has been working tirelessly since 2010 to create this culture of safety, our Ghaghoo operation has had to face the challenge of bringing the mine into an operational state and thus is in the initial stages of the full implementation of the above programmes. The achievements with regards to health and safety at both of our operations, however, speak for themselves. We recognise that the attainment of an LTI-free year is just a stepping-stone. What we want to achieve is a workplace that is completely safe and healthy and that our peers look to as an example of best practice that is challenging norms in the industry. Constant vigilance and ongoing efforts to keep health and safety at the forefront of our employees’ minds will continue to be an area of focused effort in order to deliver this objective. Letšeng Diamond Mine, HSSE Team. Letšeng Diamond Mine, BBC pact reinforcement. Letšeng Diamond Mine, Toolbox talk. Understanding the risk that our dams could pose to our surrounding communities and receiving environments, dam safety has long been of utmost importance to Gem Diamonds. In the wake of the tragic events in Brazil, we reiterate our commitment to investing in the safe operations of our dams. The dam walls, for both our waste and fresh water storage facilities, undergo stringent safety procedures in the form of inspections and audits, which are conducted both internally and externally. At Letšeng, three facilities are considered: the Patiseng tailings storage facility (TSF), the old TSF, which is now dormant, and the Mothusi Dam, our fresh-water supply resource. The Patiseng TSF undergoes stringent inspections on a daily, weekly and monthly basis, surveying various factors such as water level, beach height and overall structural stability. Quarterly structural stability inspections are carried out by an external civil engineering specialist. The old TSF is inspected daily, weekly and monthly again with quarterly structural stability inspections supplied by an external consultant. The Mothusi Dam is also inspected on a daily, weekly and monthly basis, with inspection frequencies increasing during higher rainfall periods. Outsourced specialists conduct quarterly inspections for the Mothusi wall. All three dams are closely monitored via V-notch weirs, which determine flow rate and are connected to a flow monitoring system. Facility risk assessments, resistivity surveys and flow model studies are also regularly carried out to ensure responsible management of the facilities. Letšeng has also put in place a system designed to manage the unlikely event of dam wall failure in an effectual and timely manner. An early warning system has been established for potentially affected communities with the provision of radio equipment and alarm systems. Communities have also undergone training and awareness programmes to ensure their emergency readiness. Ghaghoo currently has two slimes dams. Internal inspections on the dams are carried out daily, with structural stability inspections being made on a weekly basis. An outsourced consultancy firm has been appointed for external quarterly inspections. Ghaghoo staged an emergency drill in June of 2015 to assess emergency preparedness plans. The drill was successful, and quarterly drills are being planned for the year ahead. A risk management strategy has been put in place to negate potential threats to the safety of our dams. We believe that ensuring our dam wall safety relies on correct management procedures. Gem Diamonds ensures that the strictest management plans are put in place to ensure complete stability and conformity to the established system. Ghaghoo Diamond Mine, aerial view. Letšeng Diamond Mine, aerial view of Patiseng TSF. Addressing the daily risks our employees face is a key priority. Through our behaviour-based safety (BBS) programme at Letšeng, which has been in place for three years, we have had marked success in creating a safety culture that assists in addressing many of these risks. BBS is a process that creates safety partnerships between employees, as well as between employees and management. Through these partnerships, focus is drawn to individuals’ safety behaviour and that of those around them. Employees operate in BBS teams to share responsibility across the team. The BBS system assists employees to internalise good safety behaviour, identify risks in the workplace and make appropriate, safety-conscious decisions. "Why I work safely" competition prize giving. internal and external inspections and audits. At Gem Diamonds, we promote a culture of zero harm and responsible care. We recognise that one of the greatest dangers in an open pit mine like Letšeng is instability in the pit walls. A wall failure could not only lead to safety issues, but also to significant financial losses as a result of interruption to production and rehabilitation work that would need to be conducted. In line with our desire to be proactive in safeguarding our people and our assets, the mine has purchased high-resolution pit stability scanners that have been installed around the pit. These scanners work as early warning systems as they monitor potential large-scale instabilities, as well as local scale movements in the walls on an ongoing basis. Reports generated by the scanners are distributed electronically to the relevant parties and in the event of an issue that must be addressed immediately, warnings are sent via text message and email to enable better response times. We benefit from mining diamonds during the life of our operations, which are situated in or are surrounded by existing communities. We believe that it is our obligation to contribute to the well-being of our PACs. During 2014, Letšeng sponsored the construction of two healthcare posts in Masaleng and Pae-la-ltlhatsoa in the Mokhotlong district. The mine constructs and equips the facilities, while the Lesotho Government supplies the staff to run them. The facilities assist in the provision of primary healthcare to the local residents and relieve pressure on the district hospital. The issue of skills attraction and retention remains a material risk to the Letšeng mine. Aside from the normal factors ascribed to working in remote areas and remunerating skilled employees in a globally weak economy, localisation challenges and difficulties experienced in obtaining work permits for expatriates have exacerbated the problem. Letšeng therefore invests in creating a sustainable pool of suitably skilled employees by providing full tertiary scholarships to Basotho students for courses related to the mining industry. The Letšeng mine invested US$60 000 in education in 2014 (2013: US$0.1 million). In addition to awarding scholarships to students, Letšeng offers internships to graduates, enabling them to gain valuable work experience and further their careers. At Gem Diamonds, we are acutely aware of our potential impact on the environment, and continuously assess where our mining operations may affect the biodiversity of the region where we operate. 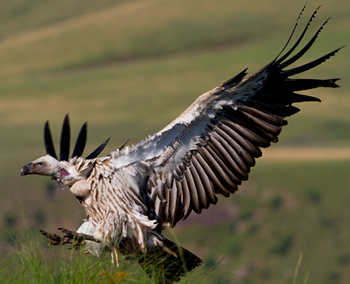 The area surrounding our Letšeng mine borders the Maluti-Drakensberg Trans-frontier Project, a high-priority conservation area and buffer zone of the critically endangered Bearded Vulture. During 2018, we began monitoring the activity of the Bearded Vulture and Cape Vulture nests near the mine footprint. From the data collected to date, it appears that the Cape Vulture is faring best, with one colony indicating a three-fold increase in active nests and the roost at one of the nests showing the first signs of breeding activity. 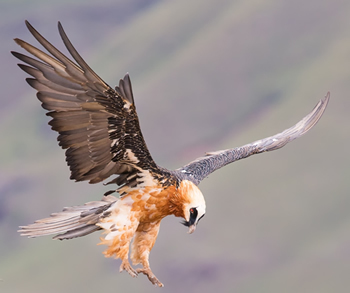 The survey confirmed, however, that the Bearded Vulture is under pressure, and active conservation programmes such as feeding projects should be initiated to increase the number of breeding pairs. Through collaboration with conservation teams, we have drafted a proposal to initiate a trial feeding programme for the Bearded Vultures that is planned for 2019. Continued monitoring will continue during this time to assess the impact of our interventions. All Bearded Vulture nests (= BV, green pins) that were surveyed in 2018 near mine. 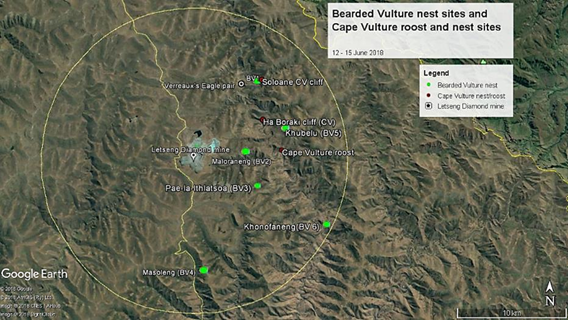 Cape Vulture roosts and nests simultaneously monitored are also shown (= CV, red dots). At Gem Diamonds, we appreciate the role mining companies can play to make a meaningful impact in the areas where we operate. We also recognise that our business needs to be profitable and sustainable to secure the value we can contribute. During 2017, Gem Diamonds embarked on a Business Transformation (BT) process aimed at enhancing operational efficiencies, improving performance and controlling costs. Our objectives also included maximising value from the operations and enabling delivery of sustainable returns, while optimising the benefit for communities and minimising our environmental impact. Until recently, our BT process was primarily set up to measure performance in relation to the Company’s financial transformation. However, to fully realise the value of BT in our organisation, we needed to measure the impact on our sustainability performance too. While sustainability principles have always been embedded as a strategic pillar in our approach, we more recently recognised the value of measuring the impact of business efficiencies and improved financial performance on our sustainability performance. As part of the BT process, we performed a high-level assessment to establish the continued relevance of these principles. We also created workstreams, focused on mapping the sustainability principles to BT initiatives, to identify impacts beyond the anticipated operational and financial benefits. In each of the BT initiatives, we were able to identify sustainability impacts that we could measure in addition to operational efficiencies. To date, we have identified 92 initiatives that will yield both operational efficiencies as well as improved environmental performance. We also identified at least 10 BT initiatives that will optimise the benefit to our host communities. For instance, resource efficiency is an example of a BT focus area that reduces the financial cost of mining but also results in environmental and community benefit. A recent World Health Organization study estimated that 4.2 million people die every year as a result of exposure to ambient air pollution. A reduction in our carbon footprint through a focus on reducing our resource consumption will, therefore, not only benefit the natural environment, but reduce the levels of air pollution exposure for our communities and employees. During the year, Letšeng sought to improve the efficiency of mobile combustion by focusing on improving the efficiency of fuel use during loading and hauling activities through driver training and the use of a fleet management system. This served to reduce fuel consumption due to driver error, lessen service and maintenance requirements on the vehicles; decrease idle and queue time through improved loading and hauling scheduling, and minimise load spillage and wastage while increasing payload size by using greedy boards. At the same time, systems were implemented to improve road and tyre maintenance. Furthermore, Letšeng employed several initiatives to improve both demand-side management and proactively reduce the high energy requirements for equipment start-up following a power failure. This was achieved through the implementation of an early warning system that would pre-empt power failures associated with extreme weather or grid instability. Generators would then be engaged to ensure that large, power-intensive infrastructure, such as our processing plants, would not shut down and thus require exponential energy input to start up again. The above measures ensured that even though Letšeng had numerous factors driving increased energy consumption, such as a 6% increase in haul distance, additional staff on-site and greater usage of generators than 2017, the Group reported an energy efficiency improvement. Looking ahead, Gem Diamonds will shift from a focus on business transformation to a continuous improvement mindset to secure the long-term sustainability of our business and, at all times, looking for innovative ways to generate value for all our stakeholders. Water is undeniably one of our most valuable resources on earth. Remediating water contaminated with nitrates at our Letšeng mine is, therefore, a top priority and forms part of our water management strategy. Bioremediation uses naturally occurring organisms to break down pollutants such as nitrates into less toxic substances. It thus creates less waste than more expensive methods such as reverse osmosis, and has also proven to be less labour intensive and more cost effective. Our bioremediation pilot project, initiated in 2015, has proven to be effectual in the treatment of nitrates. Large-scale application of the project is currently being explored to ascertain its viability in treating all contaminated water leaving the mine site. We expect the study to be finalised in the first quarter of 2019, and next steps will be determined based on these findings. As part of our nitrate management strategy, we continued to conduct leach tests during 2018. These tests involve collecting bulk rock samples at intervals across the blasting process. These are then analysed to get a better understanding of the leaching characteristics of the nitrates contained in the samples. We have found the tests invaluable in generating models that inform our interventions to reduce nitrate pollution from blasting. Interior of the bioremediation plant at Letšeng. In 2017, our focus in terms of waste management expanded to include proactively minimising waste as well as responsibly managing its disposal. Waste streams were evaluated at all our sites and opportunities to reduce waste were identified. As a result of this process, we re-evaluated the analysis of incinerator ash that is produced at Letšeng. This ash had previously been classified as hazardous, which meant that it would need to be transported across national borders for proper disposal. Its reclassification meant that we could look for more sustainable methods of disposal. The ash could be mixed with treated sewage sludge and used in our rehabilitation trials to prevent erosion, and as a potting material in seedling beds. We also looked more broadly for opportunities to reduce waste at our mining sites. One area that we identified for improvement was in the cleaning materials used on sites. They were reassessed and replacements identified based on the sustainability of their packaging and the biodegradable nature of their contents. In order to ensure that our utilisation of natural resources is done in an efficient way, water monitors were installed at our Letšeng accommodation facilities. This allows us to track water usage patterns and establish a baseline that we can use to plan how to better manage water consumption in these areas. At our sorting and cutting operation in Antwerp, our employees chose to do away with bottled water in favour of water coolers, reducing plastic and water waste. We continue to strive to reduce the amount of nitrates released from our mining processes, while actively pursuing innovative ways to mitigate their impact. Our blasting practices and procedures continue to be refined in 2017 to limit the volume of nitrates released into the environment. Our bioremediation pilot project has proven to be effective in the treatment of nitrates, and baseline studies continue to be conducted in order to establish effective practices. Though not yet at a stage where upscaling can take place, feasibility studies are being planned and we are tentatively excited about the potential of this innovative approach. In 2017, it was decided to halt fertigation trials, which were proving to be costlier and less efficient than the bioremediation trials. Extreme weather conditions also hamper fertigation for much of the year, presenting challenges to its eventual upscaling. Our leach tests were ongoing in 2017.Bulk rock samples were collected, at intervals across the blasting process, for further analysis. The rock samples are then doused with a fluctuating volume of water over a set period of time, in order for us to understand the leaching characteristics of nitrate contained in these rock samples. The results of this testing are proving invaluable in providing context for the efficacy of our interventions and have been responsible for the design of models to assist in the limitation of nitrate pollution from blasting. Our water footprint studies provide an integrated understanding of our water abstraction and water use. A water footprint can be defined as a measure of freshwater appropriation underlying a certain product, including fresh surface water, groundwater incorporated in the product or lost during the manufacturing of the product. The total water footprint for Gem Diamonds’ operations during 2017 was 8 496 384 m3 (2016: 8 701 985 m3). The water sources included municipal supplies, groundwater, surface water and direct rainfall. 5 334 786 m3 (68%), down from 5 643 403 m3 in 2016 and the Net Water Usage related to evaporation (92%), entrainment (6%), consumption (2%) and dust suppression (0.2%). The amount of water that finds its way back into the environment through discharge and seepage accounted for 2 598 339 m3 (3 023 034 m3 reported in 2016). In 2017, the total water footprint in relation to carats mined and tonnes of ore treated was 42.91 m3 per carat (2016: 37.8 m3 per carat) and 1.31 m3 per tonne treated ore (2016: 1.21 m3 per tonne treated ore). The increases were directly related to a 20 % decrease in the number of carats recovered during the period. The stress water footprint of the Group, that is the stress placed on the water system by mining activity consumption, was calculated and water usage at the operations was found to be sustainable. We carefully manage our Scope 1 emissions, that is, direct GHG emissions that occur from sources that are owned or controlled by the Group. Scope 2 emissions consist of GHG emissions from the generation of purchased electricity. We focus on reducing these emissions by enhancing efficiencies across our operations. We manage Scope 3 emissions, such as emissions resulting from employee and contractor transportation, that are most material to our organisation. In 2017, the total carbon footprint for the Group was 155 106 tCO2e (2016: 184 765 tCO2e), primarily driven by electricity consumption and mobile and stationary fuel combustion. This figure includes the direct GHG emissions (Scope 1), energy indirect GHG (Scope 2) emissions, and material (Scope 3) emissions, and was calculated with boundaries clearly defined by the GHG Protocol Corporate Accounting and Reporting Standard. The figure indicates a decrease of 16% from 2016. This observed decrease is the result of the Letšeng operation that had a significant reduction in mobile combustion and transport usage as well as the placement of Ghaghoo on Care and Maintenance. The combined decrease was observed in Scope 1 reduction of 72 282 tCO2e (2016) to 54 775 tCO2e (2017) and Scope 3 reduction of 23 112 tCO2e (2016) to 21 075 tCO2e (2017). Electricity consumption accounted for 69 571 tCO2e (45%) of the carbon footprint, (2016: 68 306 tCO2e). The ratio of 369.58 tCO2e per employee in 2016 has decreased to 347.77 tCO2e per employee in 2017. This decrease is directly related to an overall decrease in the carbon footprint. The ratio of 1.1 tCO2 per carat in 2016 increased to 1.29 tCO2e per carat in 2017. This change can be attributed to a decrease of 20 % in the number of carats recovered during the year. Dams are an integral part of mining. They are used to impound waste, store water for mine use, control runoff to prevent flooding of mine facilities, and collect and prevent sediment from running off the mine. Dams remain key areas of risk; however, as impounded material – be it water or liquid-borne solid waste – can present a hazard to miners and communities if the dam were to fail. Indeed, tailings dam failures in Canada in 2014 and Brazil in 2015 have shown that risk management at every stage of the lifecycle of a tailings dam must always be top of mind. The term tailings refers to the collected waste materials produced after the extraction of minerals and metals from mined ore, or, in our case, the extraction of diamonds from the kimberlite ore. It is a substance that consists chiefly of powdered rock and water. The aim of tailings management is to provide safe, stable and economical storage of tailings so as to protect community health and safety, as well as safeguard the surrounding environment. Unlike dams that store water or generate hydroelectric power, tailings dams are not designed and built all at once. They are gradually raised to meet mine requirements according to the life of mine planning. Once constructed, the intention is for them to remain long term during which time they will dry out and will be revegetated. At our mine sites, we ensure full lifecycle management of our tailings storage facilities that span the conception, investigation, design, construction, operation, decommissioning and closure phases. Our mine plans are in line with national regulations on waste management and storage in Lesotho and Botswana. The SEMP assessments conducted at our mines help us to keep track of our adherence to this legislation. The dams are built and maintained according to the highest structural and environmental standards. Patiseng is our active coarse and fine tailings storage facility at our Letšeng mine. In line with the plans for the mine’s expansion, during the year, the Patiseng TSF wall was fortified to ensure it is capable of retaining the tailings material for the next phase of development of the mine in line with the overarching plans for the life of the mine. This is just one of many wall expansion phases that will continue over the years to come to ensure that the highest safety standards are maintained. In addition, the dam is closely monitored via a V-notch weir, which determines the flow rate and is connected to a flow monitoring system. Facility risk assessments, resistivity surveys and flow model studies are also regularly carried out to ensure responsible management of the facilities. The same monitoring is performed for our inactive TSF. Ghaghoo currently has two TSFs, with a third under construction. Internal inspections on the dams are carried out daily, with structural stability inspections being made on a weekly basis. An outsourced consultancy firm conducts external quarterly inspections. Safety is our top priority. We maintain facilities that are safe and adhere to best practice design and management standards because we believe that we hold a duty of care towards our people, our communities and the environment that surrounds our mine. We, therefore, ensure that the strictest management plans are put in place. It is our priority that complete stability and conformity to the established system are maintained at all times. Water is undoubtedly one of our most valuable and most constrained resources on earth. Despite earth’s abundance of water, precious little of this resource is safe for human consumption. Safeguarding water sources is, therefore, a key concern for us at Gem Diamonds, in line with our duty of care. In line with our objective of conserving water sources, at our Letšeng mine, remediating water contaminated with nitrates is a key priority in our water management strategy. Over the years, a number of methods have been examined. One such method was the construction of an engineered wetland in the Qaqa Valley. The wetland construction commenced in late 2012 to test the hypothesis of the capacity of wetlands to treat elevated nitrates effectively. Unfortunately, due to the smaller and hardier vegetation indigenous to the mountainous areas surrounding our Letšeng mine, the plants were unable to absorb and use the nitrates present in the water at the rate necessary for remediation to occur at this point. We anticipate that results will improve as the wetland continues to establish itself over a longer period. The wetland has, however, served as an environmental offset area, having been restored after historical artisanal mining destroyed the area. Environmental offsetting is an intervention that seeks to counterbalance an adverse impact on one location by intervening at another location to deliver an environmental benefit. Other methods of denitrification were subsequently explored. One such method, similar to the use of the wetland but different in application, is that of fertigation. Fertigation involves the use of wastewater supplied to plants through an irrigation system. Denitrification occurs when soil bacteria use nitrates for their respiration in the place of oxygen in the air. This process occurs most rapidly in warm, wet soils. This denitrification has the positive benefit of lowering the nitrate concentration in the water returned to the system. However, due to the colder weather experienced at our Letšeng mine, the denitrification process may be affected. Trials to determine the effectiveness of this method are ongoing. One of our more promising denitrification trials is our bioremediation plant. In June 2015, a team from the University of the Free State conducted field testing at Letšeng to analyse the viability of such a project. Bioremediation is a strategy that uses naturally occurring organisms to break down pollutants such as nitrates into less toxic substances. Species in the bacterial genus Pseudomonas present high potential for bioremediation. During testing, the team discovered a dominance of Pseudomonas species in the water – this meant that naturally occurring bacteria could be used, rather than introducing an alien species, which may endanger the ecosystem in the long run. A bioremediation pilot plant was subsequently set up. Although many challenges were initially faced, including a large amount of sediment in the water impacting the flow of water through the system, once these issues were dealt with, we began to collect data to monitor the plant’s effectiveness. This method of remediation is especially appealing due to its environmentally friendly nature. Not only does it create less waste than more expensive methods, such as reverse osmosis, but it is also more cost efficient and is not labour intensive. This exciting project could be extended to other mines facing more serious nitrate or other contaminant issues than those at Letšeng, as well as other industries that face similar issues. To date, the bioremediation plant has supplied very promising results, with 90% to 99% of pollutants (nitrates) removed from the water. Large-scale application of this project is currently being explored to ascertain its viability in treating contaminated water leaving the mine site. Mining is a temporary activity, with the life of a mine lasting anywhere between a few years to a few decades. During the time that a mine is in operation, however, it generates environmental impacts that should be remediated to demonstrate responsible stewardship of natural resources. This remediation is a costly undertaking, and once a mine is no longer generating income, it is difficult, if not impossible, to raise the capital required to carry out this activity. Planning for mine closure is therefore an essential part of mining responsibly and in most cases is required by law. At Gem Diamonds, we pursue best practice in mine closure planning, going far beyond what is required of us by host country legislation as we believe that this forms part of our responsibility to our host countries and the communities that live in proximity to our mines. Every year we quantify the rehabilitation and restoration costs should there be a sudden and unforeseen closure of a mine. Adequate financial provision for this is recognised in the Group’s statement of financial position. In addition, concurrent rehabilitation is pursued at both our operations to ensure that environmental damage is continuously mitigated and not left to end of life of mine. At Letšeng, a series of trials to examine different rehabilitation applications began in 2012. The mine, which is located in the extreme highlands of Lesotho and experiences extreme weather conditions, faces a unique challenge in that guidance on successful rehabilitation is scarce. The trials are therefore necessary to test the closure criteria, which form the basis of the quantification of the mine’s rehabilitation and closure costs. The trials have been selected to replicate the rehabilitation of the mine’s main waste residue disposal facilities, that is fine tailings (slimes), coarse tailings and waste rock. The location of our Ghaghoo mine is also unique and has required a constant focus on learning and development. During 2015, a detailed update of the mine’s rehabilitation and closure plan was commissioned, as well as the associated costing, which resulted in the Group reassessing our rehabilitation liability. For both operations, the closure plans are constantly reviewed and updated based on research performed at the mines as well as industry best practice. Seed propagation project at Letšeng. Mitigating the environmental impact from mining has always been a priority for Gem Diamonds. Towards the end of 2013, Letšeng initiated a wetland rehabilitation project, along the southern tributary of the Qaqa River. Wetlands are lands saturated with water, either permanently or seasonally, and with distinct ecosystems. Wetlands provide many valuable services for humans and wildlife. They filter pollutants; reduce flooding and provide habitats for fish, wildlife, and indigenous plants. to provide a natural source of water treatment. The Qaga engineered wetland was constructed downstream of the Qaga waste rock dump. In addition to rehabilitating an area previously mined for alluvial diamonds, it is anticipated that the wetland, perhaps the highest man-made wetland in southern Africa, will improve water quality through natural biological and chemical filtering in the wetland biomass. Since 2013, the wetland has continued to develop naturally, allowing for indigenous vegetation to flourish. Through weekly volume control and water quality monitoring, there has been slow but steady progress with regards to wetland establishment and water quality improvement. We anticipate that results will improve as the wetland continues to establish itself over a longer period. In 2015, Letšeng partnered with the Lesotho government on the sponge project, to protect and conserve the ’sponges’ or wetlands in the Khubelu catchment through the sustainable management of these wetlands. The wetlands are crucial to the sustenance of the ecosystems and biodiversity in the catchment, which provides human beings with sources of livelihoods, sustain livestock and regulate water storage, quality, and flow. These benefits are not only important for the livelihoods of the local communities, but also for the growth of the economy of Lesotho. Conservation of the wetlands is expected to reverse the losses that are already experienced due to the degradation of the wetlands and ensure a sustainable flow of the services/benefits from the wetlands. One major challenge facing this valuable natural resource, however, is that livestock overgrazing and trampling are affecting the rate of erosion of the wetlands. Overgrazing harms wetlands through soil compaction, removal of vegetation, and stream bank destabilisation. Wetlands offer some of the best forage for livestock as well as a water source and cover, so livestock tend to spend a disproportionately large time in wetlands. Proper management of wetlands rests on effective rotational grazing that allows the wetlands to rest. The initial stages of this project, therefore, have involved educating local herdsman about sustainable grazing practices, ensuring that areas are grazed evenly, decreasing the risk of erosion. Following better grazing practices, the groundwater level is expected to increase, allowing the wetland to rehabilitate and sustain itself naturally. Letšeng Diamond Mine, Bongani Ntloko working on the rehabilitation trials. Letšeng Diamond Mine, artificial wetland project. Protecting the environment in which we operate is an essential focus for Gem Diamonds. We recognise, however, that environmental impacts do occur. We endeavour to avoid these if at all possible and remediate when negative impacts do occur. At Letšeng, ongoing water analysis over the years has indicated an increase in nitrates in our water due to mining explosives residue. It is also important to note that all communities have potable water. Although water largely remains in a closed loop system, some water emanating from the site as a result of stormwater runoff is affected by nitrate. In 2014, in response to the upward trend in the nitrate levels, Letšeng commissioned a nitrate management study to find and implement solutions to the problem of nitrate-infused water leaving the lease area. The study was extensive and the solutions put in place have been far-reaching in combating this problem. An official nitrate task team, which works in collaboration with the Lesotho Government, was also established. The nitrate management project began with a nitrate audit conducted to improve blasting procedures and management, as well as reducing the levels of nitrates produced at the source. Further studies were then conducted, including an investigation into the feasibility of a fertigation and bioremediation project and leach testing to better understand the scale of the issue. In June 2015, a team from the University of the Free State conducted field testing at Letšeng to analyse the viability of the bioremediation project. Bioremediation is a strategy that uses naturally occurring organisms to break down pollutants such as nitrates into less toxic substances. Species in the bacterial genus Pseudomonas present high potential for bioremediation. During testing, the team discovered a dominance of Pseudomonas species in the water. Bioremediation proved viable for the removal of nitrates, sulphates and various other salts. Bioremediation and other management options are currently being explored to assess management options available to the operation. In our ongoing efforts to pursue environmental best practice, in June 2015, Gem Diamonds sent representatives from both Letšeng and Gem Diamonds Limited to Canada to attend the 2015 Mine Closure Planning Conference and visit the local diamond mines. The trip was successful, and the team was able to gather vital information on nitrate management and rehabilitation planning which will be implemented in the year ahead. The unique, underground nature of the Ghaghoo mine presents a number of challenges. One of the major issues the mine faces is the volume of groundwater discovered during underground tunnelling activities. In early 2015, a study on the responsible management of the groundwater was finalised with several options presented, including the use of evaporation ponds, forced evaporation, constructed wetlands, water treatment for domestic consumption and use, water treatment for agricultural irrigation, game watering and finally, aquifer re-injection. In determining the feasibility of these options, it was necessary to consider a number of factors such as financial viability, environmental care and sustainability, and efficiency. While water is a scarce commodity, the water obtained from underground is generally not suitable for use without significant treatment, which is extremely costly. Thus, consumption, either by humans or game, was not a viable solution. Treatment for agricultural irrigation was less extensive and therefore considerably cheaper, however, transporting the treated water would be expensive due to the remote location of the mine. Minimising the environmental damage was also a major factor in our study. While game watering was reviewed as an option, the construction of a watering hole would severely alter the present desert-like environment and could have an effect on wildlife migratory patterns, as well as the natural ecological balance of the area of the Central Kalahari Game Reserve in which the mine is located. Wetland construction has the potential for natural water treatment, yet would again be an alteration of the natural environment. One option investigated was controlled evaporation of the water. However, the significant environmental impacts as well as infrastructural costs resulted in this option being disregarded. After extensive consideration, aquifer re-injection was deemed to be a viable option. Re-injection of groundwater has several major advantages. First, manipulation of head gradients would allow us to have a measure of control over the hydrological flow, thus helping to manage the water on a long-term basis. Secondly, groundwater re-injection is environmentally sustainable and restorative, therefore providing an environmentally friendly aid in the aquifer’s natural decontamination process. And finally, the project presents a financially acceptable option. Operational costs are minimal, and initial infrastructural setup is comparatively feasible. Furthermore, we believe that aquifer re-injection is the most responsible course of action in an environment that experiences water scarcity. The implementation and operation of the aquifer re-injection pilot project is planned for 2016, with further investigation and monitoring to take place before selecting a long-term management strategy. Masego Odrile (Environmental Officer) conducting water quality monitoring. the purchase of environmentally friendly technology. At Gem Diamonds, we aim to restore the land we use as closely as possible to its pre-mining condition. Through ongoing and extensive research and planning, we are constantly improving our understanding of rehabilitation methodologies that will help us attain our goals. During 2014, Letšeng continued with extensive concurrent rehabilitation trials, which were initiated in 2012, in order to determine the feasibility and success of planned rehabilitation strategies. These trials, which are run on four different sites with differing combinations of soils, tailings and vegetation, assist with refining the re habilitation and closure plans to ensure more effective results. establishing an environment conducive to plant growth; and – nursery management. The community is in the process of securing the correct infra structure for the nursery, and the project is well underway. Meandering hills and steep mountain passes characterise the valley surrounding the Khubelu river. Nestled in this spectacular environment, the communities in the Mokhotlong district, and more specifically in the Pae-La-ltlhatsoa community, are accustomed to the challenges associated with mountainous living. One such challenge is the seasonal risk posed by the Khubelu river, which rises during heavy rains, separating the community from their neighbours on the opposite bank. During this time, economic activity ceases, and children cannot attend school until the river recedes. Through engagement with community leaders, we established that a connection between the river banks during flood-time is critical to maintaining economic flow and functioning of community activities. We therefore began construction of a much-needed footbridge. Once completed, the bridge will provide pedestrian access for people and livestock, as well as emergency medical transport across the river. Local community authorities will be able to continue administration and serve delivery activities, while children can attend school, and trade and commerce can continue uninterrupted. 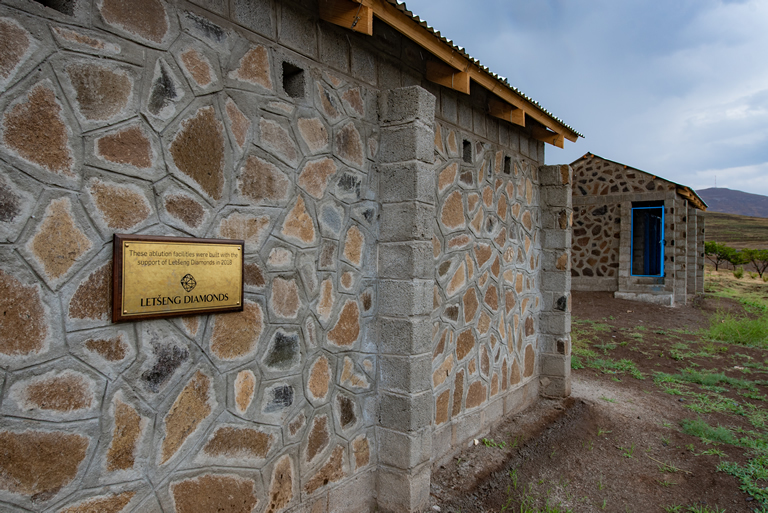 Furthermore, during 2018 classrooms were constructed at the Tšepong Primary School located within the Pae-La-ltlhatsoa community. These classrooms will greatly expand the capacity of the school and enable children of different age groups to be taught in separate classes. Additionally, following a rigorous consultation process, the need was identified for the construction of offices for the local leadership in the community to support effective functioning, and the construction of these offices was completed during the year. With approximately 70 percent of Lesotho’s population living in rural areas, farming activity supports a significant proportion of the Basotho nation . Recognising this, many of our social initiatives have taken an agricultural focus – seeking to support the creation of viable and sustainable community income streams. 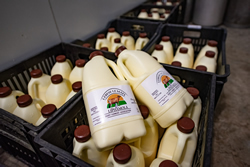 Based in Mokhotlong, our dairy farming project is an initiative that aims to deliver locally supplied pasteurised and packaged fresh milk as an alternative to the milk imported from South Africa, which constitutes the vast majority of locally consumed dairy products. Building on the remarkable success of this project to date, Gem Diamonds purchased ten additional cows during 2018 in response to the growing demand for fresh milk in the region. With the purchase of the additional cows, we anticipate that this will increase to approximately 450 litres of milk per day. 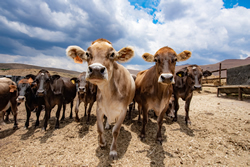 Furthermore, as part of this initiative, we have partnered with the Dairy Farmers Association in Mokhotlong to provide mentoring, business coaching and education in animal welfare, and build on the expertise of the farmers. Currently, our challenge is keeping up with the demand of the local market. Maintaining the quality of animal feed is also an ongoing difficulty, as well as securing affordable and safe water resources for the project. While sharecropping was initially considered an option to produce feed for animals, this approach proved to be labour intensive, costly and prone to theft. As a result, farmers in the area have been encouraged to plant crops that can be used for animal feed, which can, in turn, be sold to the dairy project. In 2019, we will hand over the project to the community, following our three-year financial investment to establish the project. Gem Diamonds will continue, however, with mentorship and training as required to ensure the ongoing viability and positive contribution of the project. We understand that the long-term sustainability of our business is dependent on our social licence to operate, which is inextricably linked to our ability to create shared value for our stakeholders. 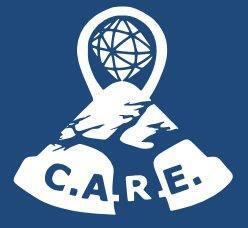 With this in mind, following the discovery of the Lesotho Legend – a 910-carat Type IIa, D-color diamond and the fifth largest gem-quality diamond ever recovered – the Board determined that a portion of the proceeds from the sale should be set aside for investment into a project that would directly benefit our host community. 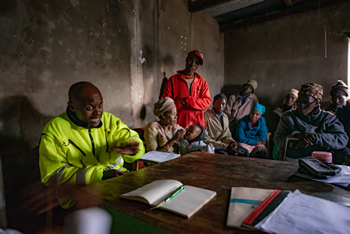 To ensure that any investment made would meet our criteria of addressing the present needs of our communities while also enabling sustainable value creation beyond the life of the mine, community members were engaged to determine the best way forward. Following the consultation process, and in line with the agricultural focus of our other social initiatives, it was determined that the project would involve the construction and development of a commercial egg farming co-operative. Investigations are currently underway to determine the optimum operating model for the co-operative to maximise the value derived for the community. As a result of regional growth, as well as an influx of employees working on the next phase of development of the Lesotho Highlands Water Scheme, the demand for locally produced eggs is expected to grow. Given this, we believe that this project will continue to produce viable socio-economic growth well into the future, meeting community needs and contributing meaningfully to local economic development. 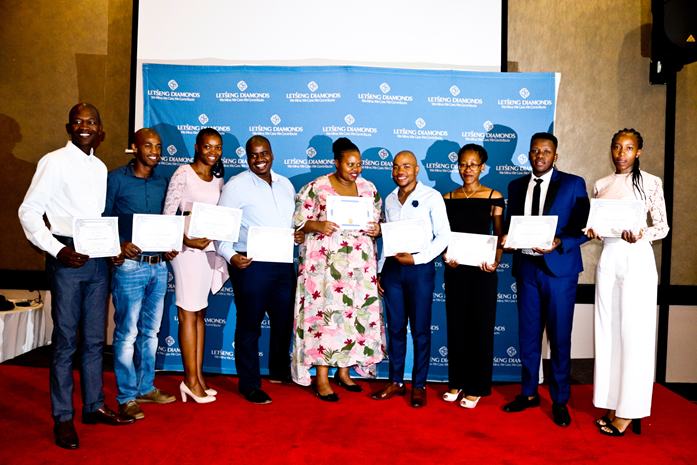 As part of our investment in the future of Lesotho, Gem Diamonds, through our Letšeng operation, provides full tertiary scholarships to Basotho students. These talented individuals (depicted below) were chosen out of numerous applicants to receive this prestigious scholarship for the entire course of their studies in fields related to mining. Letšeng believes in developing skills locally by investing in the education of promising students, thereby supporting the localisation of our workforce. The programme has been hugely successful with 43 students supported over 13 years. In addition to scholarships, Letšeng offers internships to graduates. This enables graduates to gain valuable work experience and further their careers. We recognise that the potential risk posed by both our tailings storage facilities and raw water dams necessitates a proactive approach to risk management at every stage of the lifecycle of our facilities. We monitor three facilities at our Letšeng mine: the Patiseng tailings storage facility (TSF), the old TSF, and the Mothusi Dam – our fresh water supply resource. Our dams are built and maintained according to the highest structural and environmental standards, using international best practice guidelines to inform our approach. Dam safety is a standing agenda item at operational HSSE Sub-Committee meetings, Group HSSE Sub-Committee meetings, and Group Board meetings where findings from our stringent safety monitoring processes, including internal and external inspections and audits, are discussed and regularly reviewed. Our tailings storage facilities are not designed and built all at once. They are constructed in accordance with downstream construction methods and expanded to meet mine requirements according to the life of mine planning. Patiseng is our active tailings storage facility at our Letšeng mine. Water levels at our dams are rigorously managed. All facilities have V-notch weirs that determine the flow rates and are connected to flow monitoring systems with safety limits set to trigger alerts if the measured flows are higher or lower than the established limits. Therefore, in the case of a prolonged period of rain or snow, the operation will be able to monitor any increases in water flow through the V-notches and identify possible at-risk scenarios. All facilities undergo stringent inspections on a daily, weekly and monthly basis, surveying various factors such as water level, beach length and overall structural stability. Facility risk assessments, resistivity surveys and flow model studies are also regularly carried out to ensure responsible management of the facilities. In addition to in-house monitoring, audits by external consultants are routinely performed. Any identified risks are mitigated and required remedial steps implemented. Quarterly structural-stability inspections are carried out by an independent civil-engineering specialist. To safeguard our host communities, an early-warning system, together with community training and awareness programmes are used to support emergency response readiness in the unlikely event of a failure. The alarm is activated from the central control centre located at the mine’s emergency room and can also be activated by community members should they become aware of an emergency. In December 2018, a Patiseng dam wall failure drill was conducted to determine the mine’s capacity to respond to a crisis. Information gathered was integrated into our plans going forward. With a head office in London and operations across Africa, we are always looking for ways to internalise the links between our operations and to share the unique challenges our PACs face. This year we partnered with Queen Anne's, a school for girls in Reading in the UK, to made a difference for the Kaudwane Primary School, located 220 km north-west of Gaborone in Botswana. Kaudwane has, for several years, been supported by Gem Diamonds, most recently with the repair and maintenance of classroom infrastructure. Given the economic hardships faced by many Kaudwane learners, the head teacher at Kaudwane identified crucial items which would be most appreciated by the school and the learners. The Queen Anne's students then embarked on a drive to source and donate these items. Sports kit, stationery, clothing and other items were collected and shipped to Kaudwane, to great enthusiasm from the learners there. In addition to their donations, the Queen Anne's learners also held fund-raising walkathon whereby they walked the distance between the two schools – 5456 miles from Reading, UK to Kaudwane, Botswana. Our projects are aimed at creating self sustaining employment in the rural communities in which we operate. This year the dairy project continued to progress well, with construction of offices, a milking room and a cattle shelter being completed. A herd of 17 cows is currently being milked at an average production rate of 215 litres of milk per day. This constitutes 5% of the total milk demand in Lesotho. The milk is being sold to the local market and to Letšeng Diamonds. In October 2017 milk also began to be supplied to the nearby Kao Mine. A challenge remains in supplying the local schools' market due to its distance from the dairy farm. While sharecropping was initially considered as a means of generating feed for the animals, this approach proved to be labour intensive, costly and prone to theft. As a result, farmers in the area have been encouraged to plant fodder and yellow maize for sale to the dairy farm. We look forward to the next phase of the project in 2018. The Butha Buthe vegetable project has reached a milestone and is effectively self-sustaining. The extent of Gem's involvement is the payment of the project manager's salary. We continue to monitor the project, but are encouraged by the level of ownership that has been shown by the community, and by a recent request from our staff to assist the community to build a stall from which they can safely and comfortably sell the vegetables produced by the project. Employee volunteerism is an important part of our social initiatives. For the past three years the staff at Gem's South African office in Johannesburg have supported two local non-profits: Community Led Animal Welfare (CLAW) and the Maria Kloppers branch of Abraham Kriel Childcare. CLAW is a welfare organisation known for their pioneering community-based primary animal healthcare in South Africa. CLAW brings their veterinary services to impoverished communities and vital animal care education to pet owners in Johannesburg's poorest township areas. Furthermore, CLAW distributes food parcels, facilitates a home-based-care programme to teach people how to care for the sick and dying, runs food gardens, supports child-headed households and helps communities access health and hospice care. During 2017, we supported CLAW through the donation of cash and needed items or infrastructure, as well as the sponsorship of 20 hospital beds for the veterinary clinic. Maria Kloppers provides shelter, physical care, rehabilitation and skills development for children and youths who have been subjected to trauma, abuse, poverty and neglect and parental unemployment. This is done via residential care, community services and educational programmes. Each year over the festive season Gem Diamonds hosts a party for the children, with food, games and entertainment. Prior to the event each child sends a list of gifts that they need, want, and dream of. For example, one rugby-mad young boy told us he needed rugby togs, wanted rugby balls and place-kicking cones, and dreamt of going to see his favourite team play a match. We are proud to have been able to assist the children with everything they've asked for in each category, and the young man will attend his first Lions rugby game in 2018. The party is a reprieve from what can be a difficult time, and has proved to be an emotional and enjoyable time for the children and Gem staff. In the future, Gem will evaluate ways in which we might be able to support children after they have left the care of the home. The Letšeng mine is famous for the production of large, highvalue, exceptional white diamonds, making it the highest dollar per carat kimberlite diamond mine in the world. Since Gem Diamonds’ acquisition of Letšeng in 2006, the mine has produced four of the 20 largest white gem-quality diamonds ever recovered. Seeking to showcase the uniqueness of the mine and inspire interest in the industry, on 6 May 2016, we opened our Letšeng Diamond Discovery Centre. The opening ceremony was attended by His Majesty King Letsie III. Addressing the gathering, Letšeng’s Chief Executive Officer, Mazvi Maharasoa, said: “The primary objective of the centre is to promote learning and enhance the public’s understanding of Lesotho’s diamond resources in a global context. It puts the diamond mining industry at centre-stage and details the industry’s contribution to Lesotho’s long-term economic growth.” The centre illustrates details of the diamond mining industry that many members of the public may not have previously been privy to, demystifying the industry for residents of Lesotho. The centre details the diamond’s journey, from initial diamond discovery to the sales and marketing of the product and helps enhance visitors’ understanding of the positive role of the mine in the economy of Lesotho. We are excited about what the centre can bring to the people of Lesotho as well as the value it adds for tourism in the area. Anybody travelling through the area is encouraged to visit the Diamond Discovery Centre, no matter what their interest in mining, and learn something new about Lesotho’s diamonds. Replicas of the four biggest diamonds recovered by Letšeng are on display at the Letšeng Diamond Discovery Centre. Interactive display at the Letšeng Diamond Discovery Centre. One of our most significant infrastructural projects has been the provision of water to the PACs residing in the Central Kalahari Game Reserve, which is a major need due to the arid climate. Ghaghoo provides water to Molapo, Metsiamanong, Mothomelo and Gope. The Gope community receives treated water directly from the mining site, and borehole water is used for animal consumption. While the borehole water for the Metsiamanong and Mothomelo communities was of high quality, the water in the borehole at Molapo was too salty for human consumption. The community has therefore been provided with an on-site water treatment plant. Ghaghoo has taken responsibility for maintaining the plant and ensuring that water is in constant supply. Ghaghoo adopted the Kaudwane Primary School during 2014. As the sponsoring company, Gem Diamonds has performed ongoing maintenance and repairs to the school over the past three years, including repairs and maintenance to the school’s generator, bathrooms, kitchen and classrooms. Students from the Kaudwane Primary School also attend a mine tour annually at our Ghaghoo mine. The initiative aims to educate students in the mining industry, which is a part of their classroom curriculum, supplying a first-hand experience of a mining site and the mining process. In Botswana, Agriculture is an important subject in the school curriculum. At the Lephephe Primary School, the subject is brought to life as learners integrate their classroom-based lessons with hands-on experience, learning how to prepare, plant, care for and harvest fruit and vegetables in the school’s vegetable garden. The produce grown is either used in the school’s kitchen, where students are fed two meals a day, or sold to the local community. The funds are reinvested into the garden or spent on the school’s feeding programme. Through the money raised, the school has been able to expand the garden and make improvements, such as reinforcing the bottom of the garden to keep pests out. Our Botha-Bothe vegetable production project was initiated in 2015 following a needs analysis and extensive engagement with the community. The objective was to improve the food security and nutrition of these vulnerable communities and to provide families with a sustainable source of income. The project has assisted smallholder farmers in the Botha-Bothe community by providing six greenhouses and assisting in the ploughing and planting of 32 hectares of land in the Botha-Bothe community. Farmers received comprehensive support, including training and assistance in identifying markets for their products and linkage with market requirements. In this way, farmers have been assisted in moving from subsistence farming to commercial farming. The produce from the project is sold to the surrounding communities as well as to the Letšeng mine. The income generated by the project covers its running costs. In addition, the participating farmers receive support from the project with regard to the farming of their land, which they farm for their own income. During 2016, the greenhouses and fields continued to yield quality produce. However, severe weather conditions resulted in significant damage to crops and adversely affected the profitability of the project. We will continue to support farmers in the year to come to assist them in recovering from the difficulties faced during the year. In the Mokhotlong district, in the highlands of Lesotho, much of the community is largely dependent on livestock as the major driving force for community livelihood. 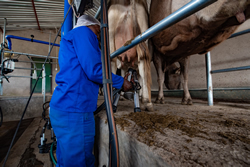 Following an in-depth community needs analysis that was undertaken in Mokhotlong and Botha-Bothe, a dairy project was identified as the most sustainable means of contributing positively to the socio-economic development of these communities. The Liphamola Dairy Farmers Association (LDFA) in Mokhotlong was identified as the beneficiary of the project. The LDFA was established in 2011 and has over 210 members across Mokhotlong. A management committee has been established to oversee the project and consists of the representatives of the farmers, Letšeng Diamonds as the financier, the Ministry of Agriculture and Food Security and Lesotho National Dairy Board. Once completed, the project will consist of two components, a farm where cows will be reared and the milk processing plant, both of which are currently under construction. Work on the infrastructure needed to support the project began in 2016.
selected because they are adaptable to any climate conditions. The processing of milk will include pasteurisation to increase the shelf life of the milk and thereafter the milk will be packaged. Individual farmers will also have an opportunity to sell milk to the farm, which will result in benefit being distributed to the larger community in Mokhotlong. The farm will also employ eight full-time staff members from the community. A biogas system will be installed as the waste management plan for the farm. All the waste that will include cow dung, human waste, milking parlour, etc will be treated to produce methane gas that will be used to heat water at the farm. The residue will be used as manure in the fields. The rearing and management of calves will be part of the training involved in this project. Furthermore, artificial insemination will be performed as part of the project. In this way, calves, which will be highly adaptable to the local conditions, will be sold at reasonable prices to community members, rather than having to import them from South Africa. Ariel Mosaase, a member of the Liphamola Dairy Farmers Association. Feeding is the highest operational cost of this project. A cropsharing arrangement has been made with local farmers whereby their land is utilised to plant crops to be used as feed. Farmers then receive a percentage of the crops as payment for the use of their land, supplying further benefit to the community. We believe that this project will produce viable socio-economic growth, meeting community needs and uplifting people for many years to come. Lephephe Primary School student participating in the school agricultural programme. Greenhouses at the Botha-Bothe vegetable project. Tomato plants at the Botha-Bothe vegetable project. Construction at the dairy farm. Farmers working the land as part of the crop sharing arrangement at Mokhotlong. The future of Gem Diamonds is inextricably linked with the future of our PACs. Our overarching aim, therefore, is to invest in their well-being in a manner that serves to nurture sustained social and economic benefit both during and beyond the life of a mine. This entails meeting the needs of the present while sustaining the ability of this generation and future generations to support themselves. This is the focus of the Ghaghoo Community Trust, which includes two trustees from our PACs and serves to implement community projects identified. Supplying water to local communities is one of the vital initiatives that Ghaghoo undertook in the very early stages of the mine development. Due to the arid climate and desertous terrain, this effort has made a life-saving difference to those assisted. To date, Ghaghoo has provided water to four communities. Boreholes were sunk in Molapo, Metsiamanong, Mothomelo and Gope. The Gope community receives treated water directly from the mining site and borehole water is used for animal consumption. While the borehole water for the Metsiamanong and Mothomelo communities was of a high quality, the water in the borehole at Molapo was too salty for human consumption. The community has therefore been provided with an on-site water treatment plant. Ghaghoo has taken responsibility for maintaining the plant and ensuring that water is in constant supply. Meeting the basic health needs of our PACs is also an imperative for our organisation. In line with this, Ghaghoo launched a project whereby health workers travel to residents of the Gope community on a weekly basis, providing health care where needed. In addition to this, a school healthcare programme was initiated. Through the provision of a mobile clinic, our healthcare team will be able to travel to schools that do not benefit from healthcare services due to their remote location. Assistance will include physicals, audio and visual testing and treatment of day-to-day illnesses. Another important focus for the Ghaghoo mine’s social investment programme was that of education. We see education as an investment in a better future for all, allowing individuals to acquire the knowledge, skills, attitudes and values necessary to shape a sustainable future for themselves and society as a whole. In 2014, Ghaghoo adopted the Kaudwane Primary School in line with the Government of Botswana’s Adopt-ASchool initiative. Maintenance was done to the school’s ablution facilities and the generator was serviced, supplying electricity to the classrooms. We also sponsored a prize giving at the school to honour and encourage achievement in academic, sporting and cultural fields. With the assistance provided through these interventions, the school has seen a pleasing increase in their pass rates over the last few years. The Trust also supports numerous other schools in our PACs by donating sporting equipment, as well as sponsoring prize giving ceremonies and prizes aimed at motivating students to fulfil their sporting and academic potential. We also worked with Lephephe Primary School, located on the outer boundary of the Central Kalahari Game Reserve, to assist in meeting their needs. A decision was made by the Trust to establish a vegetable garden in the Lephephe Primary School, erecting shade netting and installing irrigation, as well as providing an agricultural specialist to assist the school with successful management of the garden. The project has two main purposes: to educate the school children, who are heavily involved in the gardening and maintenance process, and to provide produce for the school and community, bringing vital nourishment to its pupils, and a source of income through sale of the produce. Ghaghoo also helped the Lephephe community by assisting with organising and upgrading the landfill site near the community. The infrastructure will provide better waste management as well as bring in a small amount of revenue for the community through recycling projects. During 2015, the Mine Educational Tour initiative continued. The initiative aims to educate students on the mining industry, which is a part of their classroom curriculum, supplying a first-hand experience of a mining site and the mining process. The project has been a great success and preparations to include more schools going forward have been put in place. To ensure we make a sustainable difference in our PACs, we are focused on developing a CSI strategy that will make a difference today while crafting a lasting legacy long after our Ghaghoo mine has extracted its last diamond. In order to achieve this, we have engaged an independent contractor to conduct a comprehensive needs analysis, which will examine the specific needs of our PACs and formulate the most effective way of addressing them. This will ensure a sustainable relationship between Gem Diamonds and our affected communities for the years to come. Ghaghoo Diamond Mine, Reverse Osmosis Plant. Howard Madziba (Plumber) undoing a filter. Ghaghoo Diamond Mine, Lephephe primary school. Students tending to the vegetable garden. Ghaghoo Diamond Mine, Medical assistance being supplied to the San Gope community. Ghaghoo Diamond Mine, Kaudwane Primary School. Teacher, Mrs Otukile, teaches the Standard 4 computer class. At Letšeng, we have undertaken a number of initiatives to assist our PACs in a sustainable manner, focusing on healthcare, agricultural advancement and infrastructural expansion. The majority of citizens in Lesotho engage in some form of subsistence farming. Farmers rely on their produce for income and to feed their families. In 2015, Letšeng, recognising the importance of agriculture, initiated the Butha-Buthe vegetable production project. Six greenhouses were constructed and 32 hectares of land were ploughed and planted in the Butha-Buthe community. Farmers were assisted in planting produce and were equipped with the skills and tools necessary for maintaining the project. They were trained in modern farming techniques and hydroponic watering was conducted for all the community farmers. Maintenance problems that arise are tended to by the community with the assistance of Letšeng. The greenhouses and fields have yielded quality produce throughout the year, although the drought experienced across southern Africa towards the end of 2015 presented a major challenge. The Letšeng wool and mohair project, which was finalised in 2013, has continued to offer sustained benefit to our PACs. The project helps to develop the historical practice of wool and mohair production through the provision of state-of-the-art woolsheds and training. In 2015, we were able to realise the essential aim of the project by allowing it become completely self-sufficient, with community representatives accepting complete management responsibilities. We feel that the project exemplifies a sustainable social investment, and we have been proud to see it succeed in such a great way. Making basic healthcare available to all is a major need within Lesotho. In order to assist in meeting this need, we initiated a community health workers training initiative. In 2015, we were able to train 260 community health workers, equipping them with the medical kits and the necessary skills to attend to minor health problems. This project was initiated after extensive consultation with our PACs, as well as with the Lesotho Ministry of Health, ensuring that our efforts are directed in the best possible manner to address the real needs of our stakeholders. The Letšeng on-site clinic has also been involved in community outreach when needed. The remote location of the mine means that the mine is often the nearest, and best-equipped, medical centre for travellers and community members moving between Butha Buthe and Mokhotlong. Our medical team acknowledges its duty to help out in any situation where they are needed, and they have been able to assist many travellers and locals in need. Letšeng has initiated a number of other community projects in the course of the last three years, placing a particular emphasis on educational investment and infrastructural development. Letšeng offers annual tertiary educational scholarships related to the development of Lesotho natural resources. Through consultation with other relevant stakeholders, Letšeng determines areas of study and development for each subsequent year. This encourages development in areas experiencing a skills shortage and preferential employment and internship opportunities are given to students who have been successful in these fields. Letšeng has been able to invest in the infrastructure of various communities surrounding the mine. This includes the construction of school classrooms, ablution amenities and meeting halls. In addition to this, a variety of communities have been provided with water production facilities and potable drinking water. Letšeng Diamond Mine, Butha Buthe vegetable project. Letšeng Diamond Mine, Ram Breeding Project. Letšeng Diamond Mine, Butha Buthe vegetable project manager checking on tomato crop. Gem Diamonds works in close collaboration with its PACs to ensure that the social projects implemented contribute meaningfully. With the opening of the Ghaghoo mine during the year, the Group’s involvement in the surrounding community has continued to intensify. During the public participation phase of the Ghaghoo project, Gem Diamonds gave the PACs an undertaking that, as soon as the mine became operational, a community trust would be established to guide the Company’s CSI efforts. During 2014, the Trust was registered and started its work. The Gem Diamonds trustees are Haile Mphusu and Brandon de Bruin (sales and marketing executive). The Kaudwane community elected George Pihelo and the Lephephe community, Kgomotso Kootshole, to serve as trustees. The Trust serves to implement community projects identified in a collaborative needs assessment process. During 2014, the Ghaghoo mine adopted the Kaudwane Primary School, establishing a long-term partnership. Funds were allocated by the Trust to allow extensive maintenance to be done to the school’s ablution facilities and the school’s generator was serviced, supplying electricity to the classrooms. The mine also sponsored a prize giving at the school to honour and encourage achievement in academic, sporting and cultural fields. More projects are planned for 2015, including expansions to the administration block and building additional classrooms. A decision was taken by the Trust to establish a vegetable garden in the Lephephe Primary School, erecting shade netting and installing irrigation, as well as providing an agricultural specialist to assist the school with successful management of the garden. The produce supplied by the garden is expected to provide community members with vegetables for their personal use and, through a purchase agreement, the mine is able to support the school financially in a sustainable manner. In addition, the mine aided the Lephephe community by assisting with the management and upgrading the landfill site near the community. Furthermore, the mine supported the K’joe Primary School, in the new Xade district, by sponsoring sporting equipment according to the needs outlined by the school, as well as sponsoring a prize giving ceremony at the school. Directly or indirectly, water affects all facets of life. In the Central Kalahari Game Reserve, access to water is often a challenge for the communities residing there. One of our most significant infrastructural projects to date has been the provision of water to these PACs. In 2011, we collaborated with Vox United, a non-governmental organisation, to drill for boreholes at the villages of Metsiamanong, Molapo and Mothomelo. Unfortunately, the Gope borehole was dry; thus a pipeline was installed from the mine to supply the community with water. During 2014, the Ghaghoo mine continued with maintenance and upkeep of this infrastructure despite challenges faced due to the remoteness of these sites. The Mokhotlong district, near Letšeng, experiences heavy snowfall in winter, which sometimes traps residents and tourists in the area. A need therefore existed to establish a formal community-driven body to undertake search and rescue functions in Mokhotlong. 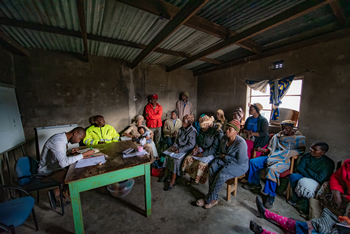 During 2013, a team of five people comprising representatives from government, the local community and the Letšeng mine attended a 14-day training course in Scotland. During 2014, the team functioned from Letšeng and also assisted with the training of employees on the mine, as well as other community members. In addition, during 2014, the mine sponsored the training of local Basotho herders in outdoor survival skills to equip them to handle the harsh conditions in the event that they become trapped in adverse weather. The Ghaghoo mine offers emergency medical care and urgent primary healthcare assistance as a service to communities. Due to the remoteness of the mine and surrounding villages, the mine clinic is the closest source of medical care in emergencies. In 2014, approximately 23 cases involving local community residents were treated for a range of ailments and other medical conditions, including the assistance of a woman in labour. We believe that by forging strong partnerships we can assist in creating a positive legacy in our PACs. On 12 November 2014, a ceremony was held at Mokhotlong Hotel to recognise the partnership between Gem Diamonds and Sentebale in support of the Touching Tiny Lives and Sentebale’s Shepherd Schools initiatives. During the ceremony, His Royal Highness Prince Seeiso Bereng Seeiso thanked Gem Diamonds for our support.